Robert E. Callahan ran Callahan's Old West Trading Post & Indian Village in Saugus's "Outlaw Canyon," at 13660 Sierra Highway. After 1986 the building was home to the Canyon Theatre Guild. 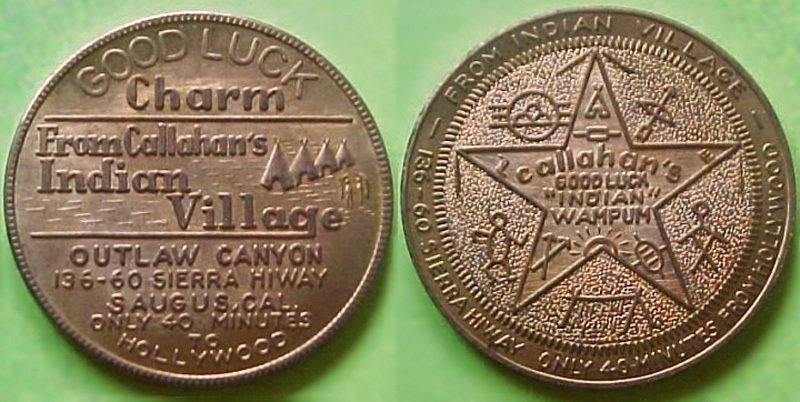 This aluminum-alloy trading token was probably issued in the 1960s. It shows the correct address: "136-60" Sierra Hiway (a common way to spell "highway" at the time). This variety is reportedly rarer than the one that shows the incorrect address.